I recently took advantage of one of those fabulous daily deals from Graveyard Mall. 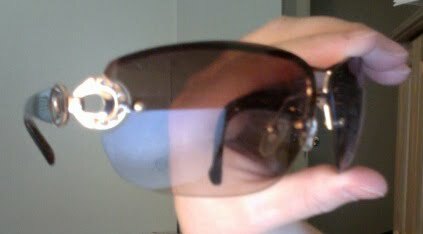 I got 9 pairs of name brand women's sunglasses for around $9.99 (plus another $4.95 for shipping), for a total purchase price of about $14.95. If you do the math, that's less than $2 for each pair. And, the way I loose and break sunglasses, I figured this was a good deal for me! When I got the package finally (their shipping is a bit slow), it was so fun to try them all on and figure out which ones I wanted to keep, and which ones I wanted to . . . GIVE AWAY! :o) Yes, that's right! I'm giving away 3 (three) pairs to BSP readers. They are all really nice, fun, chic, brand new sunglasses, and I am not being compensated for this in any way. It's all just for fun! And I will pay to ship them to you! Each giveaway will last 24 hours, and a winner for each giveaway will be chosen using Random.org. The first giveaway is for this fabulous pair of Riviera women's sunglasses that originally retailed for around $26. There are no tags on this pair, so they are ready to wear! They have a brown-ish tint to them, and fun gold bling on the sides. This giveaway will end at 10:00 AM on Tuesday, August 10, 2010, and the winner will be announced sometime tomorrow.